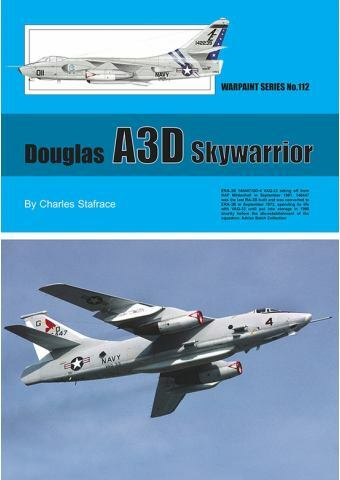 Σειρά WARPAINT No 112: DOUGLAS A3D SKYWARRIOR. Never glamorous and not receiving the recognition showered on its deck mates, the shipboard Douglas A3D Skywarrior will be remembered by US Navy fans and historians for many reasons, most of all because it figured prominently in the Cold War crises of the late 1950s and early 1960s, culminating in the Vietnam War that dragged on until the mid-1970s. The Skywarrior will also be remembered for its longevity, the first examples having shared deck space with FJ Furies aboard Second World War-vintage carriers in the 1950s, and the last examples mingling with F-14 Tomcats on nuclear-powered Nimitz Class carriers in 1987. However, this magnificent aircraft, affectionately known as the 'Whale', achieved fame in roles different from that for which it had been designed. After its strategic nuclear bomber role faded owing to changed US Navy and Pentagon policies, the Skywarrior excelled in other roles entrusted to it such as aerial tanking and electronic jamming, electronic and photoreconnaissance, vital tasks which it carried out faithfully in the first line of battle for several years from 1965 onwards. Indeed, the RA-3B version was also used during the 1991 Operation Desert Storm. Some examples were converted into bombardier trainers and VIP staff transports, while others found their way to experimental establishments and aerospace companies as testbeds for various systems and weaponry until 2011, resulting in many strange nose shapes and radomes. The Skywarrior will be recorded, too, as being the heaviest jet aircraft to ever operate from any US Navy aircraft carrier. It served with several types of squadrons - VAH, VAQ, VAK, VAP/VCP, VQ and VR. All versions and squadrons, both shipboard and land-based, are listed in this new Warpaint series by Guideline Publications, written by Charles Stafrace and illustrated by Richard J Caruana. Apart from the usual detailed text that describes each version and its operational service, several other tables are included in this profile, including production serials, versions lists, squadron use and Appendices giving detailed data on each Skywarrior cruise, specifications, and the 1962 type re-designation of US Navy aircraft. No fewer than 200 B&W and colour photos, many of which are being published for the first time, illustrate the various versions of this versatile aircraft. Περιγραφή: Σελ. 90, μαλακό εξώφυλλο, μέγεθος Α4. Βάρος κατά την αποστολή: 520 gr.